Finally, you can enter the settings to set the image resolution and take photo or record the video. 2. It took a bit for the app to setup and connect when the blue light on the endoscope to light up. 3. After connecting the phone, see if there is a charging sign on your phone. If there is, it means the charging is successful. If not or the phone screen is black, it needs to disconnect the data cable and reconnect after cleaning the APP in the background of the phone. 4. Android phones must open and have a USB share to work properly. 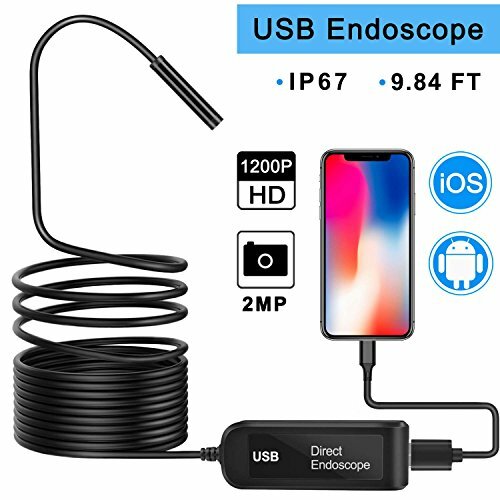 USB endoscope -- Yandu USB endoscope camera can be connected to your iPhone and Android devices via your USB cable, which is more stable and convenient than wireless endoscope. USB borescope camera with High Definition -- 2.0 megapixels inspection camera allows you to capture image at a close range up to 1600x1200P resolution or record video. The captured photos and videos will be saved to phone album automatically. USB endoscope with 8 Built-in LED Lights -- Built-in 8 adjustable LED lights on the 8.0MM diameter camera tip helps to improve visibilty in dark or low-light areas. The LED intensity can be adjusted since there is a brightness control wheel on the usb endoscope box. USB ENDOSCOPE CAMERA with 2.0 megapixels can capture clear pictures with resolution of 1600 x 1200 and record videos at 1280 x 720, you won't miss any detail of the inspected areas. Yandu usb endoscope has 1000 mAh chargeable li-polymer high-capacity battery, which can sustainable work 120 minutes and can be used as a mobile power source to charge your mobile device. YANDU USB ENDOSCOPE BORESCOPE with a bendable semi-rigid cable that can bend and hold it's shape to access a wide variety of confined place to meet with different using needs, such as curved holes or pipes. This is of vital importance to pointing and positioning camera for different using angle. USB ENDOSCOPE CAMERA PROBE meets with IP67 wateproof standard, which is suitable for inspecting underwater objects, damp or wet area, gaps and holes. No need to worry about causing damages to the camera. There are 8 pcs brightness adjustable LED lights around the endoscope camera so you can see details in dark or low-light condition, even underwater. 90 DAYS MONEY BACK OR FREE REPLACEMENT USB ENDOSCOPE BORESCOPE GUARANTEED! If there is any question, please feel free to contact us, Yandu customer support staff will provide every customer excellent purchasing experience. Log in your Amazon account > choose "Your orders" > find the order ID > click "Contact seller". We will give you a response within 12 hours. If you have any questions about this product by Yandu, contact us by completing and submitting the form below. If you are looking for a specif part number, please include it with your message.